The “Climatological Atlas of Tropical Cyclones over the Western North Pacific (1981‒2010)” has been published by Chinese Science Press. Following the previously published “The Climatological Atlas for Northwest Pacific Tropical Cyclones (1951–1980)” and “The Climatological Atlas of Tropical Cyclones Affecting China (1951–2000)”, the new atlas, compiled by Shanghai Typhoon Institute of China Meteorological Administration was published in 2017. 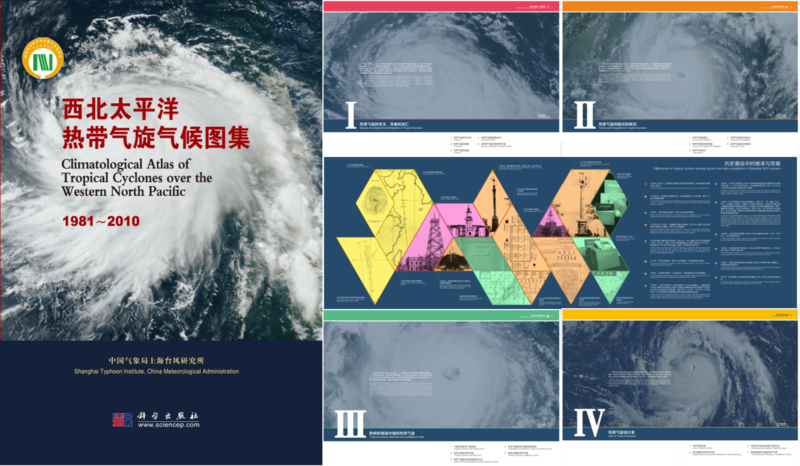 This atlas focused on tropical cyclone activities from 1981 to 2010, such as (1) genesis, development, and decay, (2) track and motion, (3) affecting and landfalling in China, and (4) associated statistics. Exquisite in design, rich in materials, detailed in data, and highly condensed in graph and chart information, the atlas not only inherits the main contents of the previously published atlases, but also introduces new materials and different perspectives. The authors hope that this atlas will be helpful to the peers in the field of the tropical cyclone research, business work, and services. 图集预览 | Preview for the atlas. Copyrights © 2012-2018 中国气象局上海台风研究所 版权所有 不得转载.